Fabulous food, great antipasti platers, wild boar pasta & super steaks. Lovely service, great evening for a large party of us. The dishes were surprising, delicious and generous. Meat was tender; pasta was perfectly done; salads ideal. We were enchanted with it all. Atmosphere was splendid. We were 4 - each of us shared our dishes just to delight each other. Price was modest for such a treat. I'll go back anytime I can!!! Great service and great staff. very lovely food. its a good atmosphere all round. It was really lovely to sit outside and enjoy the warm weather and soak in the atmosphere. Its not surprising there was only 1 person inside the restaurant and everyone was outside. I couldn't recommend this restaurant enough. You could easily fill up on the bruschetta alone! All the dishes that came out were looking lovely and our meals were very tasty. House red is a good wine to go with your meal too. Unbelievable food and a very good value for dinner in Poggibonsi. Lovely evening meal of spaghetti and attentive service throughout the night. Thank you! We booked a table for 6:30pm and even asked if they would be able to accept us earlier seeing we were to arrive ahead of time and were famished. When we arrived we were very disappointed to be told they open at 7pm. Appetizers were great, we ordered the large board to share. Mains were extreamly salty. Had a hard time eating the two fillets. With two different sauces. Side dishes were nice. Grilled veggies, salad and grilled potatoes. The dessert was nice. Service was very warm and kind. Food was served really fast. One order mistake. We waited to pay for a long time. Good typical dishes (even if we suspect that the melon caused the stomachache of one of us), avoid taking the pizza. 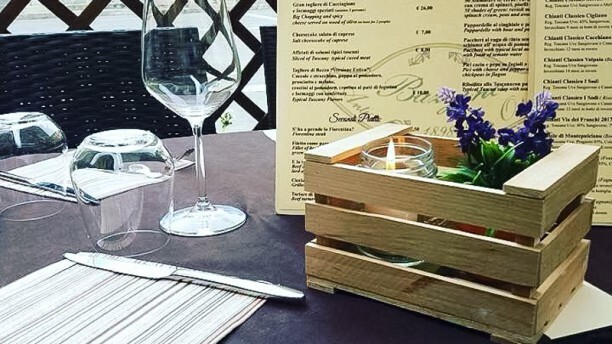 We tried this restaurant after reading others' reviews and weren't disappointed - the service was great and the restaurant itself is located in a lovely piazza with nice atmosphere. If you're in Poggibonsi I recommend you come here! Lovely restaurant with food that is worth is money as well as charming personell and a cozy location. Splendid restaurant, amazing dishes and very nice and warm staff. The quality / price ratio is incredible ! I would recommend it very easily ! Andre was funny and very welcoming but we were disappointed with the setting&atmosphere it was definitely lacking. The wine we chose was nice but the food was average based on our experience over the last 2 weeks in Tuscany. If you want to get good service, good mood and good food, this is the place to go! Loved the cheese plate with jams! Very good food, generous portions, friendly service. I fully recommend ! Bella piazza in cui cenare , specie la sera d'estate all'aperto!